Temperature measurement by pyrometry in the consolidation phase of powder metal processes faces formidable obstacles. The workpiece starts as a powder, possibly oxidized, and ends as a monolithic metal. The emissivity of the metals is known for certain to change with surface morphology, composition, wavelength, and temperature, all of which change during consolidation. Most pyrometers require the operator to input a value of the emissivity (single color pyrometer) or relative emissivity (two color pyrometer). But if both of these quantities are changing during processing, all such pyrometers will be wrong. Fortunately, an instrument exists that can measure temperature accurately despite these difficulties. The FAR SpectroPyrometer determines the emissivity’s behavior for each measurement. No operator input is necessary. An example: a manufacturer sintering tantalum periodically suffered severe process upsets where the product melted during sintering. The resulting mess and cleanup cost at least a day of production from the facility in which it happened. The temperature of the process was being monitored with single-color pyrometers which never warned that the workpieces were approaching the melting temperature. 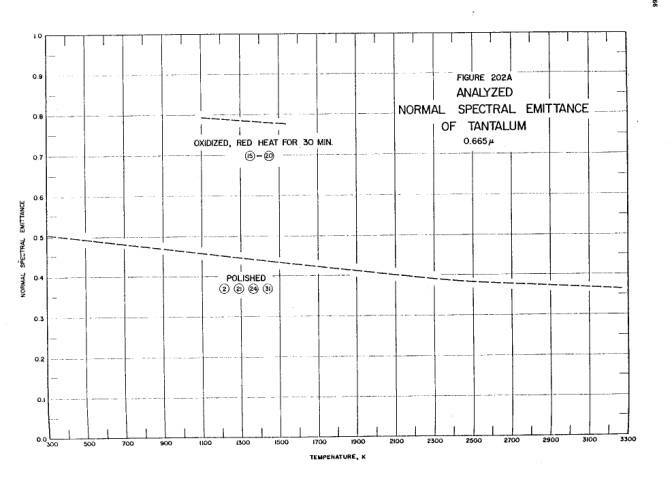 The published emissivity of tantalum is reproduced below; the graphs show the emissivity’s variation with wavelength and temperature. Both graphs are taken from Thermophysical Properties of Matter, Vol. 7: Thermal Radiative Properties, eds. Y.S. Touloukian and D.P. DeWitt, IFI/Plenum, New York, 1970. 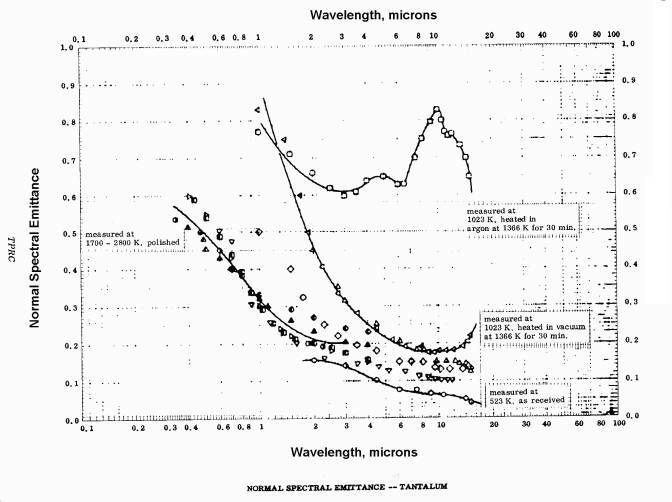 Spectral emissivity of tantalum: variation with wavelength. Temperature dependence of the emissivity of tantalum metal at 665 nanometers. "Analyzed" here means this is the best single line incorporating the results of many researchers. Measurements by a FAR SpectroPyrometer highlighted the problem. Despite the composition of the alloys used in the plant only varying by a few per cent of additives, the emissivities were very different. The graph below shows the results for two of these alloys, along with a curve drawn from the TPRC spectral emissivity plot. The changeability of the emissivity is clearly shown. It is not surprising that large temperature errors were occurring. The differences in emissivities shown below (measured by FAR) can account for 100°C of error (180°F) near the melting point. That is, if the single-color pyrometer were set to the emissivity of alloy 9x, but the material behaved as alloy GP, then target would be 100°C hotter than measured. In point of fact, a different, higher value of emissivity was being used, and errors observed by direct comparison of the outputs of the two pyrometers showed the FAR indicated as much as 500°C hotter than the manufacturer’s instrument. Not surprisingly, a few minutes later a process upset occurred, brought on by partial melting of the workpiece. Emissivity of two tantalum alloys measured by a SpectroPyrometer, and an excerpt from the Thermophysical Properties of Matter, Vol. 7: Thermal Radiative Properties, eds. Y.S. Touloukian and D.P. DeWitt, IFI/Plenum, New York, 1970. The conclusion that we find inescapable is that emissivity is just too variable to trust previous measurements or published values.